Asnake Tessema and Rihana were both sentenced to life imprisonment until a lot of transformation happened in their lives and they were finally released in Pardon. They were both in for murder and Asnake spent 18 years while Rihana stayed in prison for 11 years before their release. 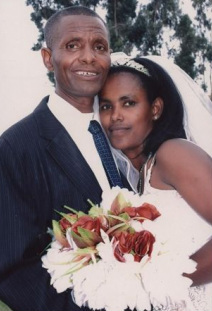 However, before she was moved to the Dessie prison she used to be in Kombolcha prison which is also found in Wollo. There, a Christian woman tells her about the Gospel and later on when she came to the Dessie prison, other Christian women create a fellowship with her. Rihana ended up to be a very passionate Christian who is always ready and diligent in preaching the Gospel to whom ever she meets. She is very much loved and admired for her strength and passion for Christ among the Christian groups within the prison. About six years ago, the two started a relation ship. Such intimacies are not approved by the prison but due to the setting of the prison there is a chance female and male prison could see each other across the fences that separate them. So the relation ship is basically restricted to just looking at each other which is customarily known as Aynuka in Ethiopian Prisons. It could be roughly translated as sight love. Prisoners use different ways to actually meet and talk to each other when they have an Aynuka. Asnake had a better chance of talking to Rihana because he was in the Prisoners Committee. 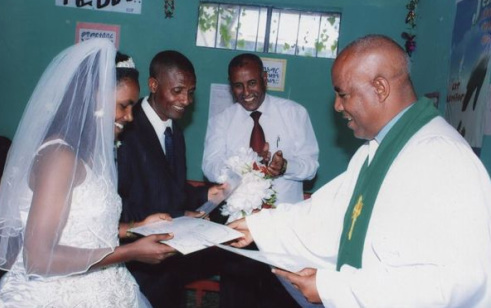 During this relationship, neither the prison administration nor the Mekane Yesus church (the church that ministers to the prisoners by using the chapel built by Prison fellowship Ethiopia) approved of it. But later on, due to the love and respect the church and the rest of the prison community have for her and also Asnake’s commendable reputation, they were finally recognized as couples. Every Ethiopian new-year the government grants pardon to prisoners who earned a reputation of improvement. As a result, this September Rihana and Asnake were in the list of prisoners that were granted full pardon. They were released a few days before the new year but they decided to stay two more days in order to tie the knot and show the glory of God in a place were they were thrown as the lowest of the lowest. Some of the prison community and the church pitched in some money and they held a small wedding ceremony in the prison chapel in presence of the prison staff including the officials. It was a very successful event that was the buzz of the prison and our office for quite some time. They went out of the prison married into the world they have forgotten for quite a while. Now they rented a room in Dessie and are striving to make a living. She is skilled in braiding hair while Asnake is skilled in embroidery works. So hopefully they will manage to make it somehow even though they might struggle a bit. Asnake was a former soldier and Rihana was just a house wife, and both their spouses are dead. So in many ways, it is like starting over everything for both of them. We wish them all the best and pray that they would be endowed with great blessing and continue to glorify the name of the Lord Jesus for the rest of their days. We were so happy with this rather unique wedding ceremony that we plastered their pictures on our office wall for a week or so. I hope you’ll also find this both amazing and blessing!